Dollhouses and displays are highlighted in a new video. 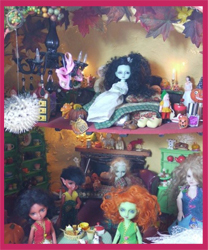 Several dollhouses including a unique “Pumpkin House” are shown along with displays on shelves and in vitrines. Check out the video, article, and photo gallery HERE. Princess Tapi creates OOAK and custom items and also unique pieces produced in very limited quantities. Luxor Academy consists of high quality ready-to-wear fashions. Princess Tapi’s designer mEda is also working on several joint projects with Charles’ Creature Cabinet. Learn more about mEda’s work HERE. The New Charles’ Creature Cabinet doll is now available for Pre-order. Bubu Odoroki is limited to 50 dolls. The company is also selling another limited release, Snoink, a teddy piglet. that has been designed by Charles Stephan and created by Tinybear’s Magical Creations. Tinybear aka Carrie Atwood, is a BJD artist and creator of Moona, Bracken and the other fair folk of y The Sleeping Elf Lmtd. Snoink is a limited edition of 30 and the cost includes shipping from Tinybear in the UK. To see the rest of Today’s News, go HERE. Interview with Charles Stephan of Charles’ Creature Cabinet! To read the article go HERE . To see the Charles Stephan Gallery Album, go HERE . Charles Creature Cabinet has posted a first glimpse of the new doll which will be Fidelia, a firefly faerie. She is described as having ” a secret magical feature”. In addition, new photos of two of the company’s dolls Deer Faith and Yoshi, were re-designed with custom face-ups by Sweetly Twisted. The new look for these dolls can be seen in the gallery HERE. Charles Creature Cabinet will be attending the Doll & Bear & Hobby Con, Bleiswijk, 24 and 25 of January. The company will have a one-of-a-kind doll on display. The doll is named Hedgehog Honey (hejjihogu hachimitsu). Doll outfit designer Linda Stephan (Lin Murasaki Design) and Tara Stephan will also be attending. The company will have the Wooding dolls on display, along with the Alice Pig series. The website for the show is HERE . Time is running out to take advantage of doll company New Year’s events. A number of special company events are currently running through most or all of the month of January. Two events end next week including the Doll in Mind (DIM) Minimee head event (January 25th), and the Demon Garden discount event (January 24). Three events are over at the end of the month including Notdoll Lab discount event (January 31), Charles’ Creature Cabinet discount event (January 31), and the Nobility Doll My Special Ball Jointed Doll event (January 31). To see the complete information on these events, go to the Company Events page on the new site HERE . The newest members of the Woodlings story have arrived. Charles Creature Cabinet‘s four new micro Woodling Fauns are now for sale on the website. The 8 cm. Limited dolls are named Issa, Jemmy, Lena, and Kimbo. They are available individually. For a limited time, the dolls will also be 20% off the regular price. The Fauns come with eyes, special wooden box, and outfit. An additional gift included with the dolls is an ‘Animal Baby Hat’ by Lin Murasaki Design. 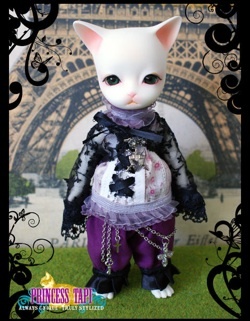 The dolls come with either the default face-up or, for an extra fee, custom colored resin, face-up, and body blushing. Charles’ Creature Cabinet has released photographs from the design process of the new Woodling Baby Faun dolls. The dolls, created by artist Charles Stephan, will be available Luna Night / Full Moon, Saturday 10th January, 15.00 pm (The Netherlands time.) In addition, for a limited time, there will be an additional 20% off their regular price. A teaser image for the new Lost Woodling dolls has been added to Charles Creature Cabinet. The four new dolls will be released January 10th. Another creature which is mentioned in the Lost Woodling story, Noanie Autumn, will be the last doll of the Woodling Saga. Her eventual release is currently not known.